Here's where to watch every episode of Brandy & Mr. Whiskers season 2. Mouseover or tap an episode to see where to stream it. Click or tap the play icon to stream it on the best available service. Get a Job Feb 3, 2006 After exploring an abandoned Mayan temple, Brandy & Mr. Whiskers come across a hidden shopping mall, in which they each want to purchase an item of their choosing. However, when it turns out that the items they want cost a lot of shiny rocks, they decide to get jobs at the mall to try to get the shiny rocks they need. However, things take a turn for the worse when Brandy starts to skip work whenever she gets the chance. Jungle Makeover Feb 3, 2006 Brandy is upset that Mr. Whiskers decided to throw a party because their house doesn't look good enough. The two head off to the Mayan Mall in hopes of getting some material to redecorate their home, though the two of them soon find each other at odds when their sense of style clashes with one another. Brandy & Mr. Whiskers split their house into two in order to see who had the best sense of style, though Brandy becomes jealous when Mr. Whiskers wins a contest and has his side of the house completely remodeled. Pop Goes the Jungle Feb 10, 2006 While at the Mayan Mall, Brandy discovers that a karaoke contest is taking place and she decides to enter it. However, her singing skills aren't that great and despite her best efforts, everybody who listens to her thinks she's horrible. All hope seems to be lost, though Mr. Whiskers stumbles across one of the best singers in the Amazon and he devises a plan to secretly have her sing in Brandy's stead, in hopes of getting Brandy to win. Wolfie: Prince of the Jungle Feb 10, 2006 While at a local lagoon, Mr. Whiskers inadvertently pushes Brandy off of a cliff, though she is rescued by a wild dog as she is falling. Brandy immediately falls in love with Wolfie, though when it turns out that he is less hygienic than Mr. Whiskers, she does what she can to forge him into the perfect boyfriend, though will she be capable of such a feat? The Tell-Tale Shoes Feb 17, 2006 While at the Mayan Mall, Brandy is attempting to teach Whiskers how to walk around properly. However, when she is insulted and laughed at due to the fact that she isn't wearing the latest fashion footwear, she decides to head off to the store to purchase a new pair as quickly as possible. However, when it turns out that the new shoes cost too many shiny rocks, she takes the advice of her subconscious mind and she steals the shoes; though Mr. Whiskers' warning about the story of The Tell-Tale Heart soon puts her in a state of confusion. r teeth whiter, though will Melvin really like her new look? Any Club That Would Have Me As A Member Feb 24, 2006 When Mr. Whiskers witnesses the Carnivore Club harassing some nerds at the Mayan Mall, he decides that he wishes to aspire to become a member of their club, as they are some of the coolest individuals in the Amazon. However, Mr. Whiskers isn't cool enough, so he convinces Brandy to train him in order to make him cooler, though will Brandy's lessons actually be enough to make Whiskers cool enough to get into the club? Where Everybody Knows Your Shame Feb 24, 2006 Brandy attempts to dye her hair, though when she discovers that it didn't turn out right, she desperately attempts to change her hairstyle in order to make it better to look at. Unfortunately, she makes her hairstyle much worse and when the Amazon discovers her secret, she is humiliated and she runs home in order to hide. However, Mr. Whiskers formulates a plan to humiliate the entire jungle in hopes of getting people to stop harassing Brandy for her horrible hairstyle. Better Off Wet Mar 3, 2006 While on their way to an Amazon water park, Brandy and Mr. Whiskers witness the local lifeguards help another creature who had hurt its toe, though Brandy takes notice of the fact that the local animals all idolize the lifeguards. 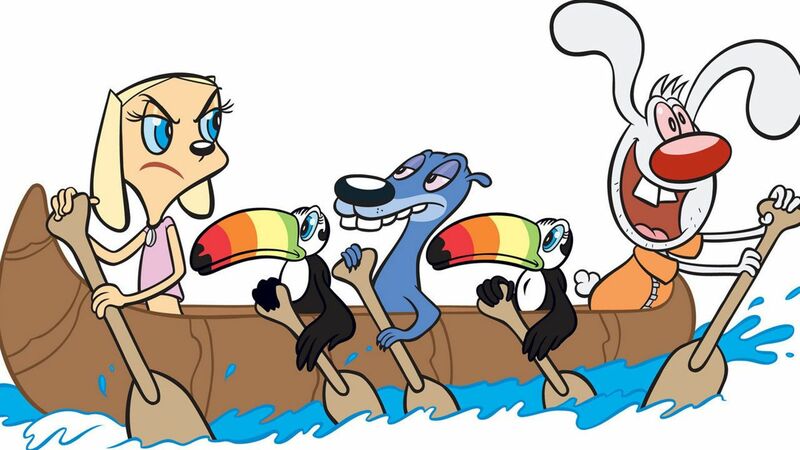 Brandy manages to join their ranks while Mr. Whiskers takes swimming lessons in hopes of aspiring to such, though Brandy has a secret of her own that may cause problems should she need to answer the call of duty. Loathe Triangle Mar 3, 2006 When Margo sarcastically tells Mr. Whiskers that she's in love with him he attempts to find a way to win her heart, so he seeks Brandy's advice. However, Brandy mistakenly believes that Mr. Whiskers is actually in love with her, much to her dismay, so she attempts to convince him to never speak to the girl he loves again. However, things take a turn for the worse when Ed gets involved and begins to fight for Margo's affection, which causes Brandy to think Ed loves her as well, though will this love triangle manage to be resolved without offending the parties involved? Pet Peeves Mar 10, 2006 Mr. Whiskers brings home a small pet rodent after accidentally destroying its habitat during a game with Ed. However, Brandy is skeptical because Mr. Whiskers' previous pet parakeet and fish both died due to his negligent nature, though she decided that she'll give Mr. Whiskers one last chance in seeing if he can be responsible enough to take care of the rodent. However, when Mr. Whiskers falls asleep with the tree house door open, he frantically searches for the rodent in hopes of bringing it back before Brandy notices his absence. What Price Dignity?! (Cheap!) Mar 10, 2006 When Brandy takes notice that some of her older outfits are falling out of fashion, Gaspar arrives and he shows her a new dress that he has, though he only offers to give it to her if she'll pretend to be his girlfriend while his mother is visiting. Brandy is reluctant to participate in the deal because she cannot stand Gaspar, though she decides to go through with the deal for the sake of the dress. However, Brandy soon discovers that putting up with Gaspar is too much even for herself, so she decides to use Whiskers in an attempt to drive Gaspar's mother out of the Amazon. You've Got Snail Mar 17, 2006 When Mr. Whiskers' toy ball falls onto a snail's yard, Brandy attempts to get the ball back in order to get Mr. Whiskers to stop crying. However, when the snail turns out to be a complete jerk who claims that he owns the tree that Brandy and Whiskers live in, Brandy decides to take drastic measures in order to try to force the snail to move away; though the snail proves to be more resilient than Brandy had originally anticipated. The Magic Hour Mar 17, 2006 When Gaspar finds a pair of ancient socks that grant him limitless power, he finally takes full control of the Amazon and he forces countless creatures to pay him tribute in various fashions. As the grasp of despair causes many animals to lose hope, Brandy discovers that Mr. Whiskers may just have the knowledge of magic necessary in order to save the Amazon, though there's a problem: Mr. Whiskers is afraid to use magic ever since a tragic vanishing legs act, though will Brandy be able to convince him to overcome his fears? Net of Lies Mar 24, 2006 When Brandy realizes that she promised to participate in a firefly event with Whiskers on the same day Lola Boa bought tickets to a concert in the Amazon, Brandy decides to try to figure out a way to lie to Whiskers in order to get out of her prior engagements. However, when Brandy decides to just leave Whiskers and head to the concert, Whiskers becomes worried because he thinks Brandy may have been abducted by the fireflies, so he heads off to rescue her. Dog Play Afternoon Mar 24, 2006 Mr. Whiskers is excited because there is an audition taking place for a play in the Amazon, though his comments on the subject causes Brandy to decide to enter as well. However, when Margo sabotages Brandy's audition by messing with her drink, Brandy only manages to become the understudy while Margo gets the main role; though Gaspar makes a proposal to Brandy that may just help her get the position that she feels she deserved. Auntie Dote Mar 31, 2006 When Brandy and Mr. Whiskers wake up and realize just how messy their house is, they decide to seek professional assistance in order to keep things clean. However, when Auntie Marla turns out to be the best thing that has ever happened to them, Brandy and Whiskers decide to keep their place a mess in order to keep her coming back each day. Though things soon take a turn for the worse when Brandy and Whiskers vie for Auntie Marla's affection in order to see who her favorite is. Curses! Mar 31, 2006 When Brandy purchases an amulet from Gaspar in order to prove to Whiskers that she is an excellent bargain shopper, she is dismayed to discover that the amulet is actually cursed. However, when Gaspar tells her that the only way to remove the curse is to get someone to willingly take the amulet from her, Brandy must try to trick someone into taking the amulet or risk spending an eternity being haunted by a rude specter who has a tendency of causing problems. Con Hare Apr 7, 2006 When Gaspar sells Mr. Whiskers some meteor insurance in exchange for a Sugartoad poster, Brandy realizes that what Mr. Whiskers' gained was merely a toaster. She tries to tell Mr. Whiskers and when he finally believes her, he heads off to Gaspar's in order to try to get his poster back, though his attempts yield no results. Mr. Whiskers then asks Brandy for help, in which she suggests that Mr. Whiskers attempt to con Gaspar back in order to retrieve the poster, so Mr. Whiskers employs Ed and the two head off to try to trick Gaspar into giving back the Sugartoad poster. Rain Delay Apr 7, 2006 Brandy has managed to schedule a samba lesson with a very attractive dancer, much to Margo's chagrin, though the weather takes an unfortunate turn for the worse. Mr. Whiskers wants Brandy to stay inside and play games with him, as the weather is too dreary to travel in, though Brandy decides that she must weather the elements or risk having Margo receive the samba lessons instead of herself. Sandy & Mr. Frisky Apr 14, 2006 Brandy and her friends are playing truth or dare when they hear some screams. When they investigate the issue, they discover another dog and rabbit, Sandy Carrington and Mr. Frisky, who have landed in the Amazon after Mr. Frisky accidentally opened the plane's cargo door. However, Sandy & Mr. Frisky are the best of friends and they soon work together to become the two most popular individuals in the entire Amazon. Unfortunately, Brandy & Mr. Whiskers become jealous over the fact that Sandy & Mr. Frisky does everything better than them, so they decide to formulate a plan to ruin their reputation. Thinking Outside the Fruit Apr 14, 2006 Gaspar and Mr. Whiskers are in an argument over whether or not Mr. Whiskers can do something. Brandy jumps to Mr. Whiskers' defense by saying he can do anything he can put his mind to, in which she agrees to a wager that she'll scrub Gaspar's floor with a toothbrush if Mr. Whiskers cannot succeed. However, when it turns out that Mr. Whiskers wants to try to build a car out of fruit and drive through the Amazon's most dangerous locations in less than a day, Brandy instantly loses confidence in Mr. Whiskers and she hires some help in order to ensure that she won't have to scrub Gaspar's floor. Go! Fight! Win! Apr 21, 2006 Brandy wants to tryout in hopes of becoming a coco ball cheerleader, as she believes she was born for the position, though Mr. Whiskers decides to tryout for the position as well. However, when the cheer leading coach likes Brandy and Mr. Whiskers so much, she decides to name them both captains of the squad; though when the two's style begins to clash, they must compete in a cheer off to see who deserves the position. Class Dismissed Apr 21, 2006 Brandy and Mr. Whiskers decide to go down to an unused lagoon in order to soak up the sun and make the most out of their time in the Amazon. However, when some panthers that live in the area start to chase the two away, Brandy decides to enter a self defense class in hopes of learning how to fight the carnivores off. Though when Brandy becomes too distracted with boys to bother signing herself up, she gets Whiskers to do it for her; though such turns out to be a decision that she'll regret. Itty Bitty Kitty Apr 28, 2006 Whiskers finds Brandy's favorite soft toy from when she was younger, and annoys and embarrasses her by convincing her to play with 'Itty Bitty Kitty' once again. When Brandy gets infuriated, Mr Whiskers gives the toy to Gaspar, though Brandy tries to get it back. Brandy's Best-Ever Boyfriend Apr 28, 2006 Brandy notices all her ex-boyfriends have new girlfriends, and tries to save face by making up a fictional boyfriend. However, things take a turn for the worse when Mr. Whiskers attempts to actually find the individual that Brandy described. Stress Test May 5, 2006 After taking a survey, Whiskers goes to Lola and Ed to see if he's been stressing Brandy out. When they say he does, they show him and Brandy a tv ad for placid falls, and Brandy decides to give it a chance. However, many obstacles await them, such as a loud restaurant, doom river, and a banjo stringing contest. A Little Problem May 5, 2006 After Brandy tells Whiskers to always stand up for his rights, he's pushed into the kiddy pool, and finds out Gaspar is their too. After all fails with trying to get on the ride they so richly desire, Whiskers remembers Brandy telling him to stand up for his rights. However, will he get on the ride even with the protest of animals? A Really Crushing Crush May 12, 2006 Ed and Lola Boa have a crush on each other, so Brandy tries to make the relationship perfect, while Whiskers tries to sabotage the whole thing. Pickled Tink May 12, 2006 Brandy hypnotizes Whiskers with a pinwheel, and he instantly begins cleaning whenever he hears the word 'Pickle'. Unfortunately, everybody in the jungle starts saying the P word. The Monster in My Skin Jun 17, 2006 When Mr. Whiskers gets a pimple, he thinks he's turning into a monster. Dollars and Senseless Violence Jan 17, 2006 When Mr. Whiskers finds a bag of shiny rocks, he and Brandy argue over what they should do with it. Big Girls Don't Body Slam Jul 21, 2006 When Whiskers decides to join Gaspar's wrestling league, he makes Brandy his tag team partner. However, Brandy soon proves to be an excellent wrestler and she adapts the alias of Sammy Crushington. I Am Rainfo Jul 21, 2006 Mr. Whiskers finds a book about the Amazon Rain forest, though what he discovers scares him. He decides to steal the lifeboat roof from the tree house and sets off to live in the ocean, though will he succeed in his endeavors? The Tortoise And The Hare-Brain Aug 25, 2006 After being mocked by tortoises, Whiskers decides its high time to challenge the tortoises to a match to tend the tortoise and the hare story end. Rip Van Whiskers Aug 25, 2006 After Whiskers thinks he has been bitten by a frog that can make victims sleep for 50 years and decides to do a lot of things with Brandy including "kiss a preety girl". When Brandy finds out she's the girl to kiss, and the frog that Whiskers had been bitten by has to convince Whiskers the truth.